Apple's prospects for present and future growth land it on a Top 25 list, an iPhone app for kids authored by a 9-year old is gaining popularity on the App Store, and new animations could eventually make their way into Safari in this roundup of recent news. Forbes has named Apple (AAPL) one of its 25 fastest-growing tech companies for the first time since the list began in 2003. Apple ranks 14th with 20 percent projected growth on its earnings per share and 40 percent projected sales growth in the next three to five years. To qualify, companies needed 12-month revenues of $25 million or more, annualized sales gains of at least 10 percent over the past five years, and a profit over the past 12 months. List leader Illumina makes products and services for genetic analysis and research, while Google came in second. Salesforce.com, which Apple worked with to monetize the iPhone for business, was third. Additionally, Apple partner Akamai and Genentech were 23rd and 25th, respectively. Genentech chief executive Arthur Levinson serves on Apple's board of directors along with Google chief Eric Schmidt. The creator of Doodle Kids, a finger painting app downloaded 4,000 times in two weeks from the App Store, is more than just a kid at heart. He hasn't even entered middle school. 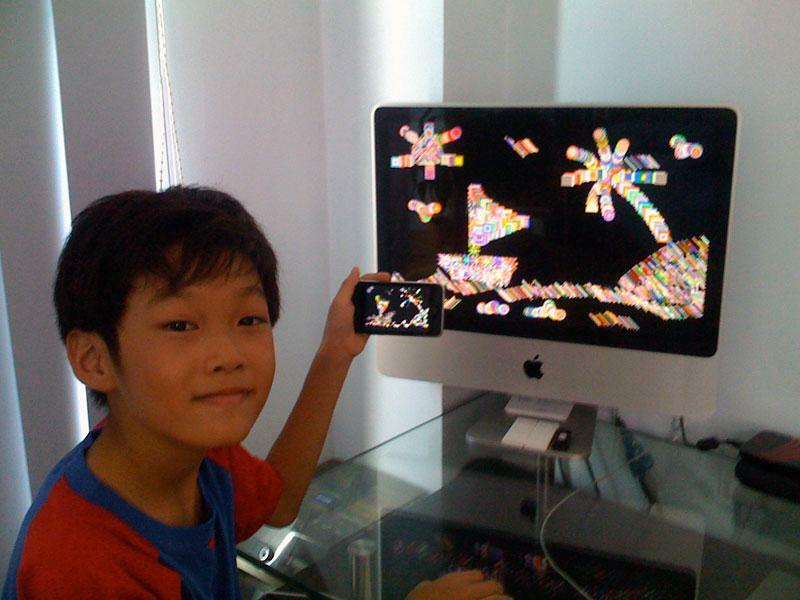 Lim Ding Wen, 9, of Singapore, said he was just trying to give his siblings something to do. "I wrote the program for my younger sisters, who like to draw," he told the BBC. "But I am happy that people like it." Lim's father, Lim Thye Chean, is a chief technology officer at a Malaysian tech firm. He also writes iPhone applications, and the two like to compare statistics each night to see who has more downloads. "Ding Wen is an above average boy with an interest in computers, especially Apple IIGS and Macs, likes to do programming, and that's it," the boy's father wrote on his website. "Doodle Kids is an extremely simple program that can be done by anybody. Everybody can program - if Ding Wen can, so can you." Nonetheless, the younger Lim said the app took only a few days in Pascal to write, converting it from the original application he wrote on his computer. Lim is working on another new app called Invader Wars. He is fluent in six programming languages and has been using computers since he was two years old, and he's completed more than 20 programming projects since age 7. The feature uses keyframes to control the animations, according to a post on the WebKit blog. "A keyframe defines the style that will be applied for that moment within the animation," the entry says. "The animation engines will smoothly interpolate style between the keyframes." The technology is already built into Mobile Safari on the iPhone, meaning it will likely make it into the desktop version. To test it out, first download the latest nightly build of WebKit, then click to see falling leaves, bouncing box, and pulsing box, three demonstrations from the WebKit team. Google books iPhone-friendly; Amazon Kindle books next?